Digital technologies are enabling new ways for citizens to document and share memories and records of their collective past. This seminar will explore our ongoing fascination with superimposed montages, known as 're-photography' or 'then-and-now' composites. This technique has grown in popularity with photographers and amateurs over the last decade through ready access to digitised museum archives, image-making software and sharing via social media. Archival images are 're-animated' – abruptly or seamlessly – to create new apprehensions and evocations of duration, occupation and tense. Successful results blur our normal distinctions between present places and previous events and inhabitations. A number of examples from Melbourne and further afield – including Pastport.com, a mobile web app for residents and visitors in the Port Phillip area – will be discussed, and some thoughts will be offered on why we remain enthralled in the effect of ‘Then and Now’ composites. Image: Crichton Street in Garden City, Victoria. This mass housing experiment was initiated by the State Savings Bank in the late 1920s. 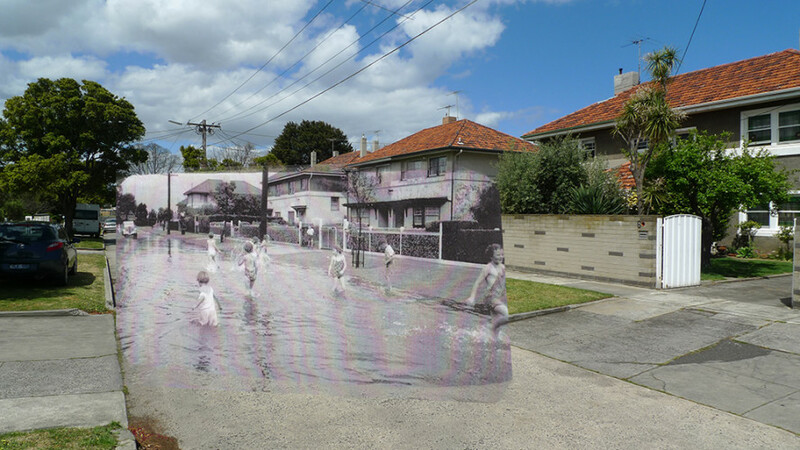 The street flooded in the 1930s. Re-photography image by Andrew Murray.